May Almighty God, to whose glory we celebrate this festival of all the Saints, be now and evermore your guide and companion in the way. Amen. May God, who has bound us together in the company of the elect, in this age and the age to come. Attend to the prayers of his faithful servants on your behalf, as he hears your prayers for them. Amen. May God, who has given us, in the lives of his saints, patterns of holy living and victorious dying, strengthen your faith and devotion, and enable you to bear witness to the truth against all adversity. Amen. – The Book of Occasional Services 2003, p. 28-29. This blessing for the Feast of All Saint’s offers a succinct summary of the day, our relationship with the saints, and, in general, the spiritual life: presence, prayers, and practice. These three aspects are deeply interrelated and in some way mutually dependent. Presence: There are several aspects of presence within this blessing: between God and humanity, between us and the saints, between us and each other, and finally, between us and our selves. Presence implies participation in one another’s life and is characterized by unity, wholeness, self-giving, and integration. 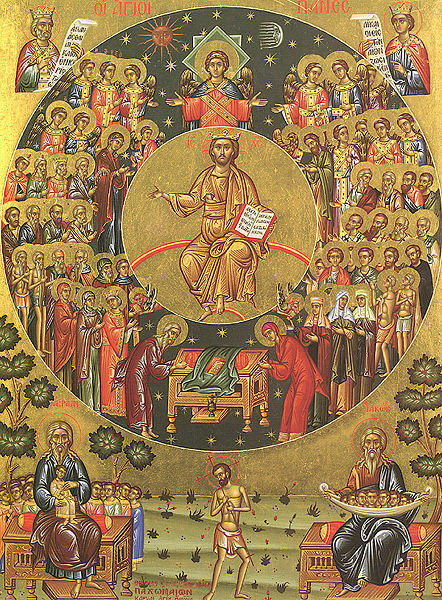 Practice: The saints are our teachers and guides in our own practice of “holy living and victorious dying.” They are trustworthy because they patterned their lives upon and embody the holy living and victorious dying of Christ. We see in their lives what this looks like in the various times, places, and circumstances of earthly life.